Lift astrology out of the sun-sign columns, interpret your birth chart, and discover the true meaning of the stars and planets, and their influence on your personality. Most people know their sun sign and the broad character traits that go with it: Leos are leaders, Scorpios are secretive, and Cancerians are sensitive. 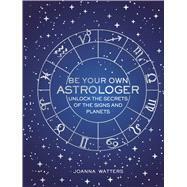 However, there is much more to astrology than this broad brushstroke approach, and in Be Your Own Astrologer, bestselling astrologer and tarot reader Joanna Watters gives you the tools you need to gain a deeper understanding of your sign and insights into hidden aspects of your personality. Joanna goes beyond the sun signs to look at the importance and influence of every planet’s position in your birth chart. She will guide you, step by step, on your personal astrological journey and you will soon be able to interpret your own natal chart. Joanna Watters is an expert astrologer and tarot reader, and the bestselling author of Astrology for Today (Carroll & Brown). She runs courses in astrology and tarot interpretation as part of her Greek Island Summer School and in London, UK. She lives in Lefkas, Greece.